Land boundaries: total length  6,221 km. 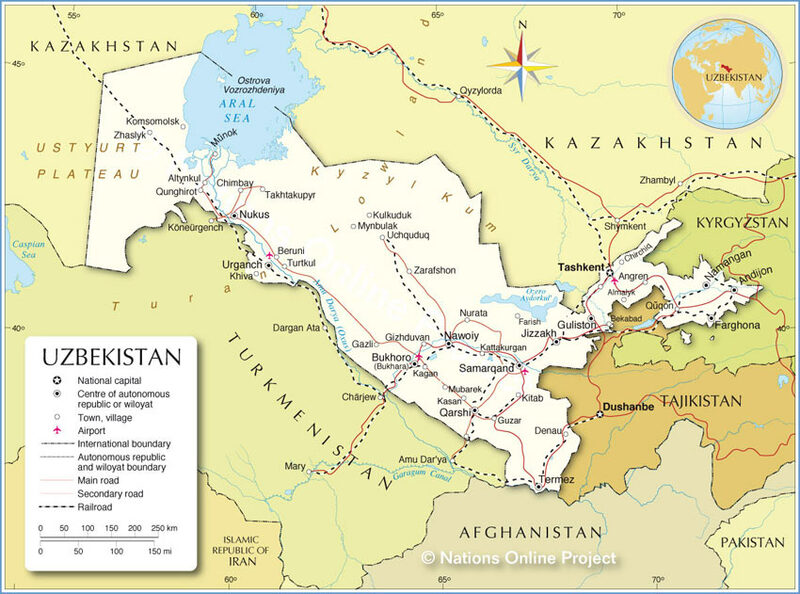 Extent of borders with Afghanistan  137 km, Kazakhstan  2,203 km, Kyrgyzstan  1,099 km, Tadjikistan  1,161 km, Turkmenistan  1,621 km. 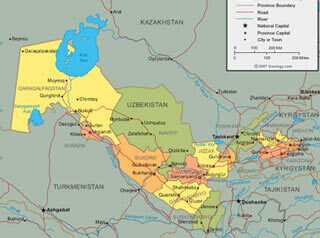 Terrain: most of the territory of Uzbekistan is occupied by plains (near four fifth of the territory). 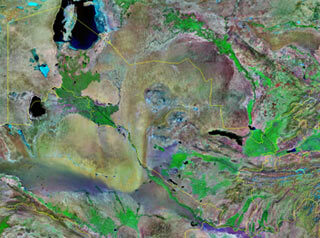 One of the main is Turanian plain. In the east and northeast of country are situated spurs of Tien-Shan and the Pamirs, here is the highest spot of country (4 643 м). 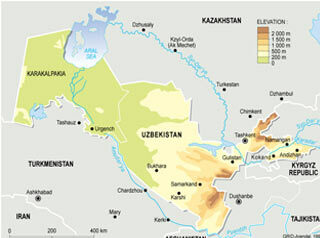 There is one of the largest desert of the world – Kizilkums on the north of central part of the territory of Uzbekistan. 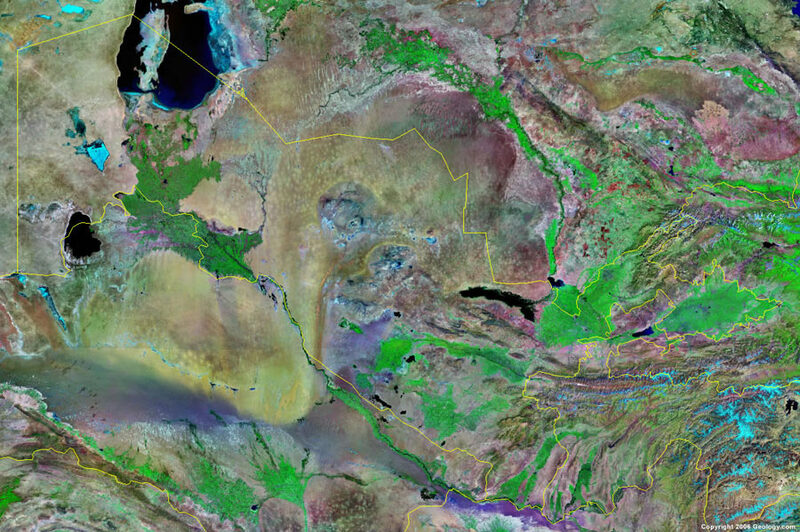 Climate of the country is mostly middle attitude desert-continental. Difference of temperatures depending on times of year is quite significant. Average January temperature goes lower than -6oС, but average of July rises higher than +32oС. The amount of rainfall is little, that’s why agriculture mostly depends on irrigation. The symbol of the state flag of the Republic of Uzbekistan goes back to the national and cultural traditions of the states, which existed in the territory of present day Uzbekistan. The state flag was approved by the 7th session of the Oliy Majlis (Parliament) of the Republic of Uzbekistan. Blue symbolizes everlasting sky and water as main life sources. The color means kindness, chastity, glory and faithfulness. It was blue that the great Amir Temur chose for his state flag. White is the traditional symbol of peace. It represents harmony with daylight and heavenly bodies. This color symbolizes purity and high moral aspirations. Green is the color of natural revival. It is the symbol for youth, hope, and energy. The red lines of the flag symbolize life. The crescent moon is associated with the historical traditions of the people and can be considered the symbol of newly gained independence. 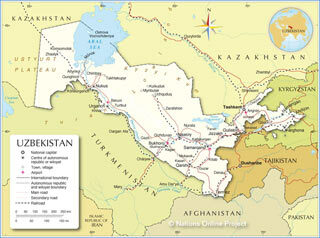 There are 12 stars on the state flag of the Republic of Uzbekistan. 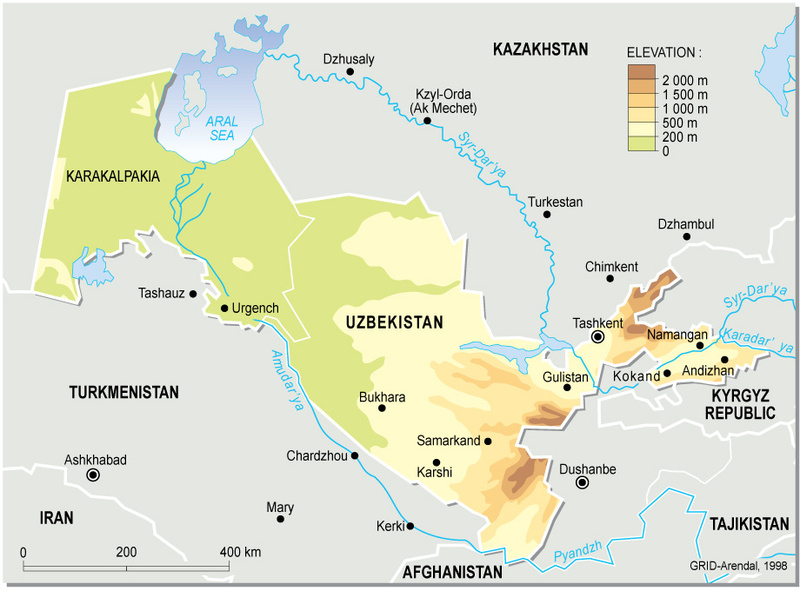 The stars, associated with the traditions of the Uzbek people, are connected with the signs of the Zodiac, which served as basis for old solar calendar. The 12 stars depicted on the state flag symbolize the centuries old culture of the Uzbek people, striving for harmony and happiness. State Symbol. Background of the State Symbol is raising sun. In front is Khumo bird, which is called as Semurg, Davlat kushi (Bird-State) and Kultubulgan (Sunny bird) in ancient works drawn in front. Khumo - means bringing happiness, along with Nauryz holiday this bird gain honor as the symbol of Saving Power, Honor and selflessness and goes along with Uzbek people hope for peace, kindness and happiness. 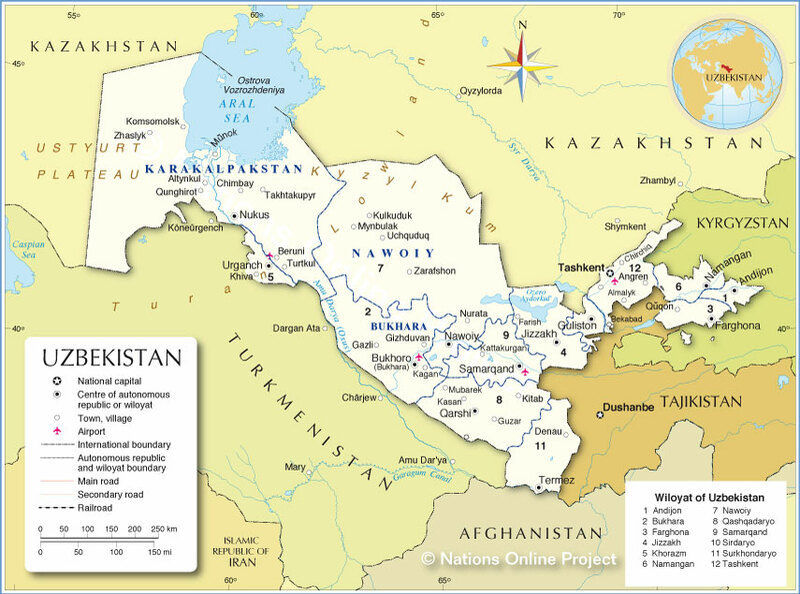 Khumo is drawn with raised wings, which embrace the Uzbekistan land with its mountains, green valleys, rivers and gardens. 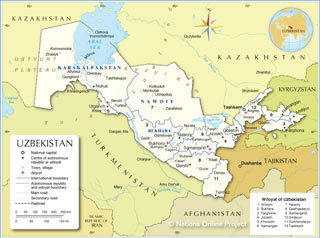 Below on the image of Uzbekistan Flag word UZBEKISTAN is written. From both sides of the bird wheat and cotton are drawn. It means that cotton, as well as bread, grown by people symbolizes bounty. Up on the Symbol is octahedron, that symbolizes bounty, unity and variety of the world, used from ancient times in Uzbekistan's handicrafts. A star and semi moon is inside the octahedron, as Holy symbols of Muslims.